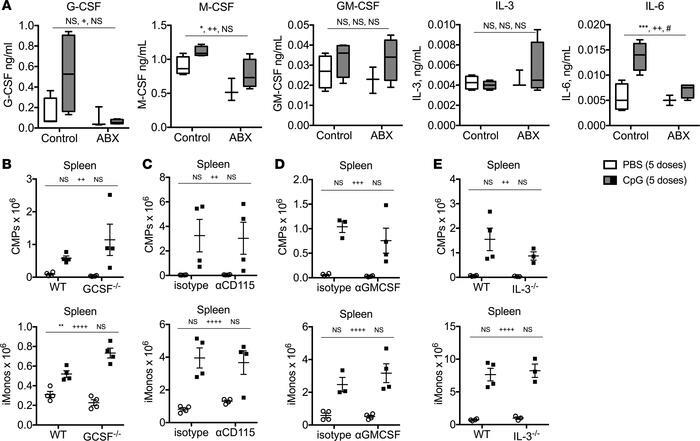 Inhibition of individual myeloid-specifying cytokines does not impair TLR9-enhanced myelopoiesis. (A) WT C57BL/6 mice were treated with antibiotic (ABX) or control water for 3 weeks prior to receiving 5 doses of PBS or CpG1826. Serum cytokines were measured by ELISA 24 hours after the last injection. Data are graphed as box-and-whiskers plots showing minimum/maximum, and the line in the box shows the median value. (B) WT C57BL/6 and G-CSF–/– mice were treated with 5 doses of PBS or CpG1826, and numbers of spleen CMPs and spleen iMonos were enumerated. (C) WT C57BL/6 mice were treated with anti-CD115 (the M-CSF receptor) or isotype control antibodies in combination with 5 doses of PBS or CpG1826 injections over the course of 10 days, and numbers of spleen CMPs and spleen iMonos were enumerated. (D) WT C57BL/6 mice were treated with anti–GM-CSF or isotype control antibodies in combination with 5 doses of PBS or CpG1826 injections over the course of 10 days, and numbers of spleen CMPs and spleen iMonos were enumerated. (E) WT C57BL/10J and IL-3–/– mice were treated with 5 doses of PBS or CpG1826, and numbers of spleen CMPs and spleen iMonos were enumerated. Analysis was performed by 2-way ANOVA (*P < 0.05, **P < 0.01, ***P < 0.001, interaction; ++P < 0.01, ++++P < 0.0001, control vs. antibiotic treated; #P < 0.05, ##P < 0.01, ###P < 0.001, PBS vs. CpG in vivo treatments). In A the interaction terms term is CpG treatment x Antibiotic treatment. In B–E, the interaction terms are CpG treatment x antibody treatment or CpG treatment x genotype.